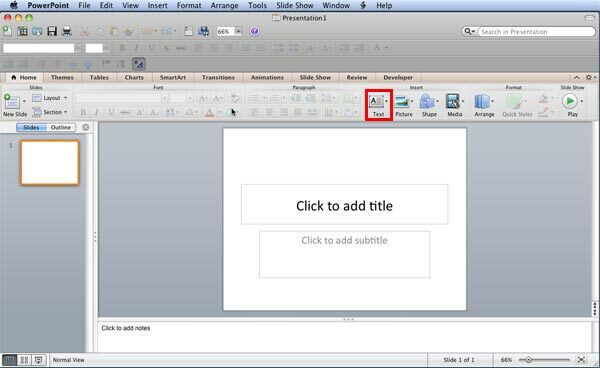 Learn how to insert a text box in PowerPoint 2011 for Mac. You never insert a text placeholder on a slide since they are part of the layout for your slide. Launch PowerPoint. You will see the Presentation Gallery which allows you to set all attributes of your new presentation, such as a preset Theme or template. 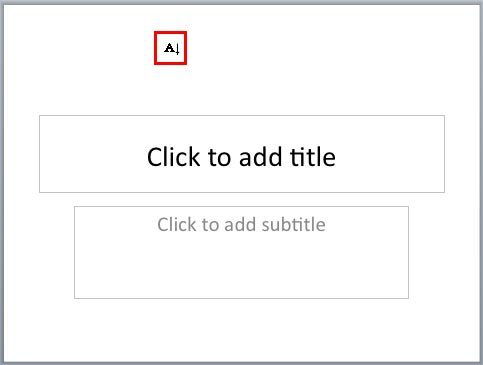 Make selections or just click Cancel in this gallery to open a new blank presentation, containing one slide as shown in Figure 1. Within the Home tab of the Ribbon, locate the Insert group, and click the Text button (highlighted in red in Figure 1 above). This opens the Text menu shown in Figure 2. Choose the Text Box option in this menu (refer to Figure 2 again). 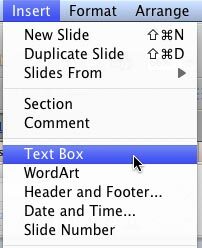 Alternatively, you can directly choose the Insert | Text Box menu option, as shown in Figure 3. This changes the cursor into a vertical line along with the character 'A' in front of it, as shown highlighted in red in Figure 4. Figure 5 shows a text box inserted that contains typed text. 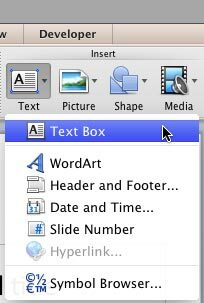 In subsequent tutorials, you will learn how you can work with text boxes, and format them. 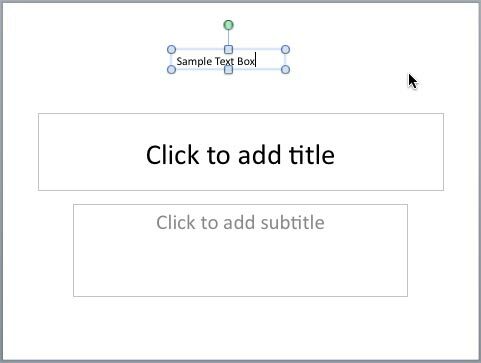 Also a text box is just another shape in PowerPoint -- so any of the tutorials on using shapes in PowerPoint are relevant to working with text boxes.